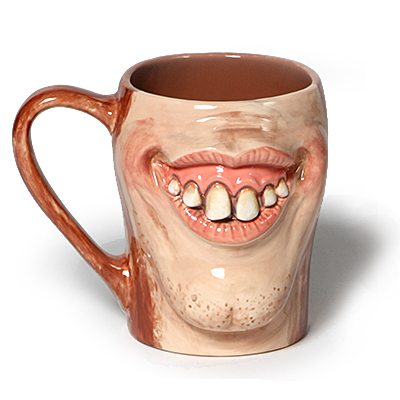 Big goofy smile mug measures12cm tall by 9cm wide. SC-1 Pink-A-Boo, SC-6 Sunkissed, SC-14 Java Bean, SC-15 Tuxedo, SC-74 Hot Tamale, FN-27 Glade Green, Clear Glaze. Moisten a clean sponge and wipe bisque to remove any dust making sure not to over saturate the bisque. Using the Soft Fan brush, apply three coats of FN-27 Glade Green to the inside of the mug. Using Soft Fan brush, apply one heavy coat of SC-15 Tuxedo to the face. Wait for it to dry then remove with a damp sponge. Allow the black to remain inside the detail lines and groove of the mouth. Use CB-404 Pointed Round and CB-200 Detail brush to glaze the face. Start by applying two coats of SC-1 Pink-A-Boo to the face and gums. 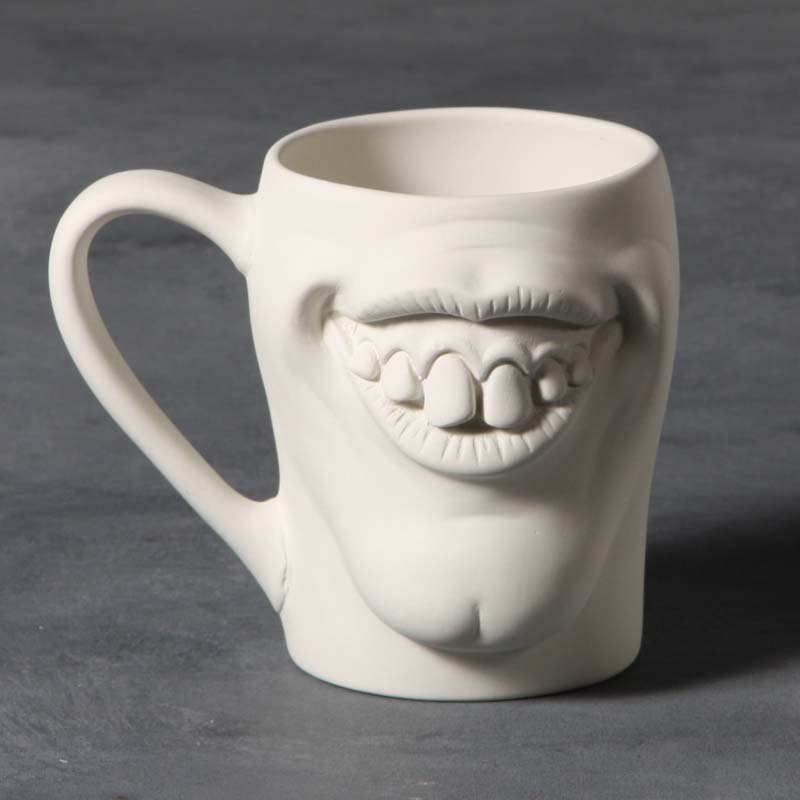 Bring it down to the bottom of the mug. Apply one coat of SC-74 to the Cheeks and lips. Apply two coats of SC-6 Sunkissed to the teeth. Use SC-14 Java Bean to create shadow under the chin, cheeks, and teeth. You will also use this to create freckles on the cheeks. Using the Soft fan Brush, apply two coats of Clear Brushing glaze to the entire piece, or use dipping glaze.